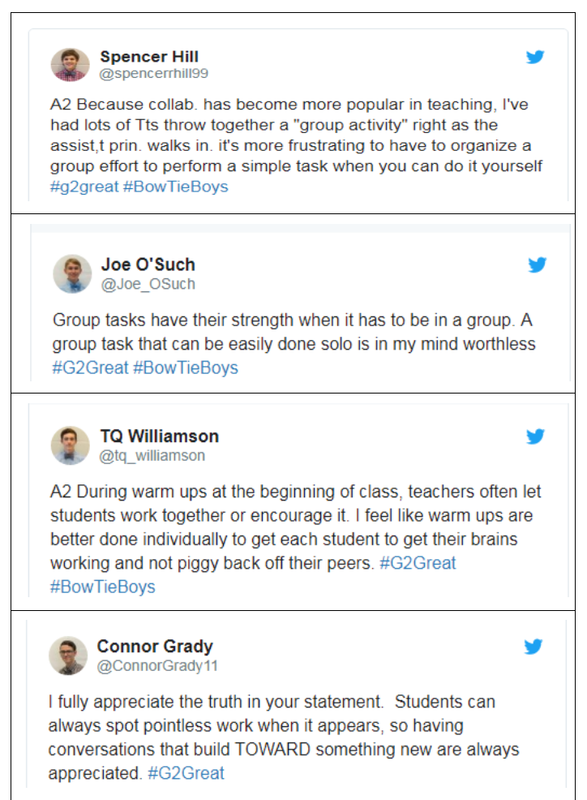 Our #G2Great chat family was abuzz with excitement on 12/13/18 when our good friends #BowTieBoys led by teacher Jason Augustowski returned as our guest hosts (excitement that was elevated by a first time visit from our new friends, #HairBowGirls). #BowTieBoys have taken the chat seat of honor on five previous occasions including 4/26/18, 3/8/18, 5/25/17, 3/6/17 and our very first #BowTieBoys event on 6/9/16 with guest Sam Fremin. Their most recent visit followed their presentations and attendance at NCTE 2018 in Houston last month based on their reflections of the NCTE theme of Student Voice and Choice. These remarkable young men talk, rap and write about education, sharing with educators their belief that teachers are the key to making our schools a more positive and productive place as they offer specific suggestions that would bridge the existing teacher-student gap. Pause for just a moment and imagine what these young men ranging from grade eight to senior in high school have accomplished. I wonder how many of us could even envision sharing our ideas about teaching at a national conference, YouTube Channel, or blog post. Having experienced their powerful voices in each of these arenas, I am well aware that their collective commitment to education drives them. They are so uniquely accomplished at raising their voice and listening to them is a reminder that students are our future. I was originally inspired to create this group when NCTE came to Washington D.C. in 2014 (our backyard). I had already presented in Chicago, Las Vegas, and Boston and was inspired by how many teachers came to these conventions to collaborate – all in the name of doing right by kids. And that’s when I thought – but there isn’t a kid in the joint. How do we know for sure that we are accurately meeting their needs if they aren’t a part of our planning, our assessing, our grading, our environment building, etc.? I had built a really strong rapport with my students and their families not only through teaching, but through directing school and community musicals and coaching travel paintball. Bringing students along to the conference was the next step in my own professional journey and one in which I truly and whole-heartedly believe. We have to ally with students as 50-50 partners. We need to create with them to offer the most authentic choice and experience in their learning. When establishing environments, we must not only work with our colleagues, but with our kids. We need to make rapport central to the classroom (the famous quote: no kid cares what you know until they know that you care). Let’s replace worksheets with inquiry and assigned readings to libraries of inclusive and diverse texts. Let’s stop focusing on the “rules,” “playing school,” and “the way it is/has always been” and become rebels, disruptors – true educators (that are first and foremost informed ourselves). But not informed by state mandated curriculum. Not informed by politicians who have never set foot in a classroom. Informed by the constituents with whom we work each day: the students (and dare I say it, their parents). And I learned all of this from my students (when I sat down long enough to listen). We presented in D.C. with Sara Kajder about shifting the classroom paradigm (both in terms of flexible seating and autonomous instruction). And I was proud. And I thought this magic could never happen again, for NCTE 2015 was scheduled to take place in Minneapolis… and there was no way parents were going to accompany their kids across the country, right? Wrong! Being a male teacher, I assumed that male students gravitated to me which is why our group was comprised of boys. So, when our then small group presented in Minneapolis (this time with Lester Laminack) we decided to dress in matching outfits and boast bowties. Lester immediately dubbed us “the #bowtieboys” and the name stuck. 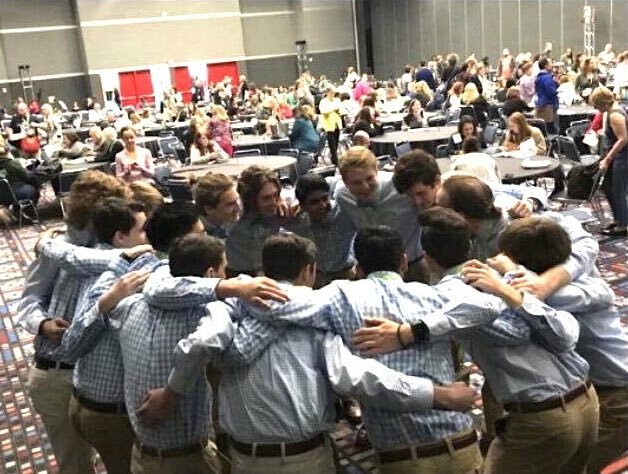 Traveling around that conference and the following year in Atlanta, the students were able to learn, make connections and networks with our teacher heroes, enjoy the vendors, and experience a professional situation not common for their age. But after Atlanta in 2016, we were in store for another major shift. Our group grew from three to ten and would then grow again in 2018 to fourteen. At the start of 2017, our then group of ten, took to the interwebs with a commendable force and passion. They established Twitters, blogs, a YouTube channel, began conducting professional research (they have collectively read my entire professional library), and working on a textbook in which they could encapsulate their flowing ideas. They were dedicated to make a change in education by showing teachers what students can do when given the environment and support. They wanted to partner with teachers and promote that partnering all across our nation. And to some extent (at least we like to believe) they have. 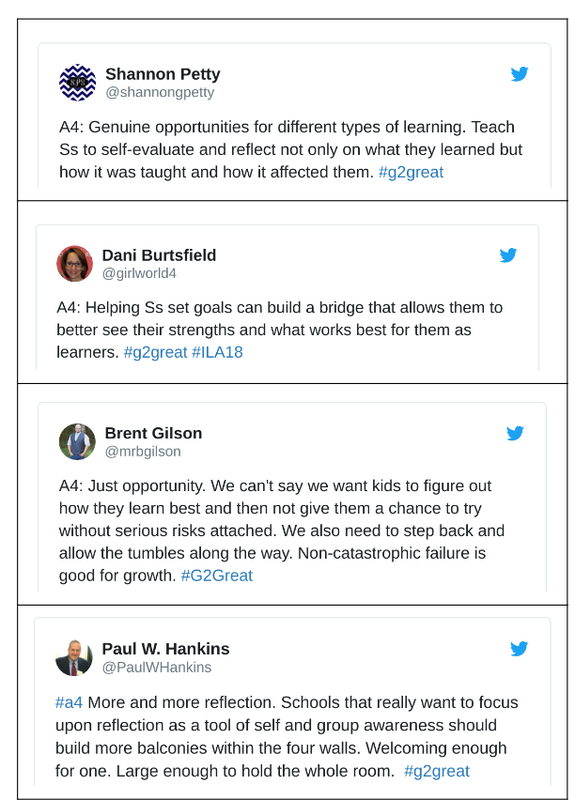 They have had the opportunity to present multiple times in St. Louis and Houston, guest host five #G2Great chats, and one #NCTE chat. They have led professional development for career switchers and teachers in our home county and they are ready to do more. Being a member of #bowtieboys comes with responsibilities beyond your own school demands. What motivated each of you to become a member of this group? School stopped being fun for most of us in late elementary or early middle school in part due to a loss in curiosity and creativity. Learning and school in general felt like more and more of burden and our natural curiosity was constantly degraded. Part of why many of us joined was because we saw that school degraded our curiosity, not building it, and that needed to be changed. Not only did curiosity degrade over time, but many of us felt that even as we became closer in age to teachers, they would become more and more standoffish. By advocating for change in these regards, many of us also wanted to push outside our limited bubble and interact with the world in a truly impactful manner. How have you benefited as a member of the #bowtieboys? Due to the special and groundbreaking path of the #bowtieboys, we have built nearly unparalleled leadership skills. It is also never a bad thing to be part of anything new and innovative, which is the mission of our group. By reaching into new audiences, we have been able to become affluent with networking skills and advocate for ourselves and others. We have reached into a broad scope outside our confined bubble and interacted with teachers and educators across the nation. We have had an incredible audience to communicate with and for the first time for many of us, we our writing for an intrinsic, not extrinsic cause. By truly doing something we are passionate about, which no doubt requires a lot of time and effort, requires significant self-motivation. Developed leadership and networking skills and have seen a dramatic rise in our public speaking ability. Started to intellectually evaluate more than just the material and have constructive criticism. Speaking off the hip and being able to talk on the spot. Learned to share our thoughts in constructive ways. Been able to reach outside my own bubble and look at many other parts of the world and open my eyes. Been given a chance to thoughtfully voice opinions and open the door for other students. Gotten more well-spoken and confident. Become better, more articulate writers. Started to write for an actual audience and not a grade, but an intrinsic drive. Received a platform to speak from and advocate for myself and others. Each of you have presented at NCTE, many of you on several occasions. How has this experience changed you? What contributions do you feel that you have made as a result? NCTE is a lot of networking, plain and simple. By connecting and interacting with educators across America, we have had to build our networking skills, often in a trial by fire. To effectively network, we have to be not only willing but proactive in talking to others. Often, we develop into our own cliques, which isn’t a bad thing, but NCTE helps us move outside these cliques. 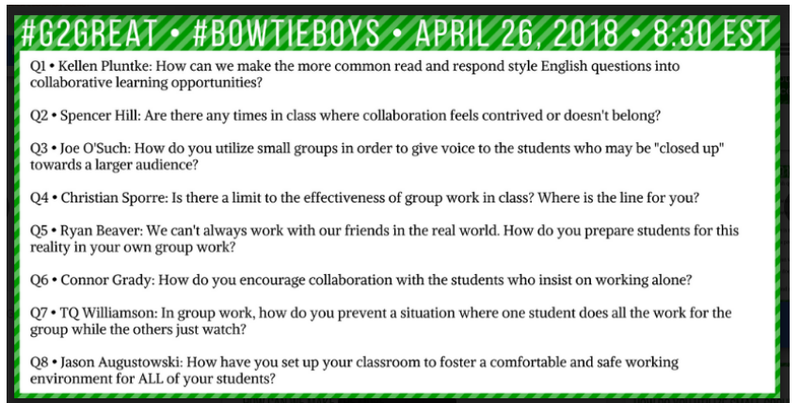 Not only does NCTE break down any cliques within the #bowtieboys, but also gives us experience to talk to others outside our groups. In much of the same trial by fire, we have had to become capable to talk (and rap) in front of hordes of teachers. Many adults have rambled on the importance of public speaking, yet few students participate in public speaking outside of class presentations. NCTE gives us a raw unfiltered experience of public speaking. Finally NCTE is one of our greatest assets in the regard that it serves as our most valuable platform. We put the idea of student voice and choice on full display, often by intertwining typical classroom experience with other intricacies of our lives, seemingly unrelated to teaching, to construct coherent and constructive feedback for teachers from their clientele: the students. Through the fantastic experience that is NCTE, one remarked that they had smiled in those four days more than they had smiled for years. Why is it important for educators to keep their minds open to what students have to share with us about our own practices? Give an example of how you think your efforts can change the professional world. Education is to some degree a business, with teachers as the employees and students as the clientele. In any successful business, the employees must cater their products to their clientele. We are the clients of education, and by no means should we completely control the realm of education, but we must be an integral part of the education field. Students are constantly changing, which makes it all the more vital that education changes. Yet this cannot happen without student input, which is why our group is built on giving constructive student critiques that emphasize student voice and choice. Much like how writers don’t notice some of their mistakes, teachers may not notice some of their mistakes. The students can act as a peer editor for the teacher. It makes any of our days when a teacher either asks us what we think could take their teaching from good to great. Even by opening up educators’ mind to student feedback, we feel we have made a pronounced impact on the professional world. What is one thing that we can do as educators to listen more openly to our students for the purpose of understanding possible changes that will benefit student learning? One of the schools in our area has a unique schedule where four days a week, students meet with one of their teachers for about 30 minutes and discuss how things are going in that class. Although it is more than a stretch to implement this, the concept can be used as a quick warm up or exit ticket. Just ask your students to give their constructive thoughts on how you can make learning enjoyable. Although there may be ridiculous comments, many students will take the opportunity seriously. Although this isn’t the best way, it is a subtle one and a way to show that you care about your student’s voice. Overall just embodying a transparent pedagogy and keeping an open mind can drive student voice and change. 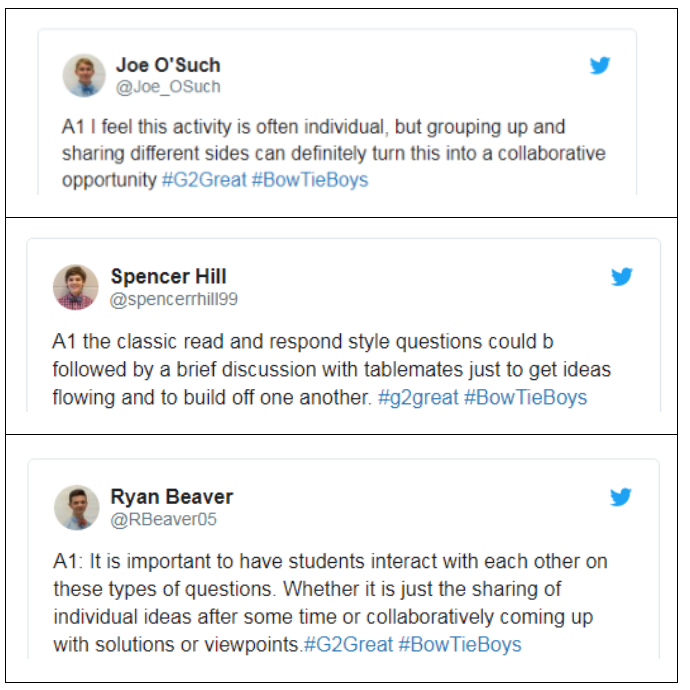 We have had members of the #bowtieboys contribute to the #g2great chat five times since Sam Fremin originally participated in the chat in 2016. What have you gained from these twitter chats? Learning new ideas and being able to voice our own ideas has been a cornerstone of the group since we began. With the chat, we have been able to receive quick input from teachers and students from all around the country. 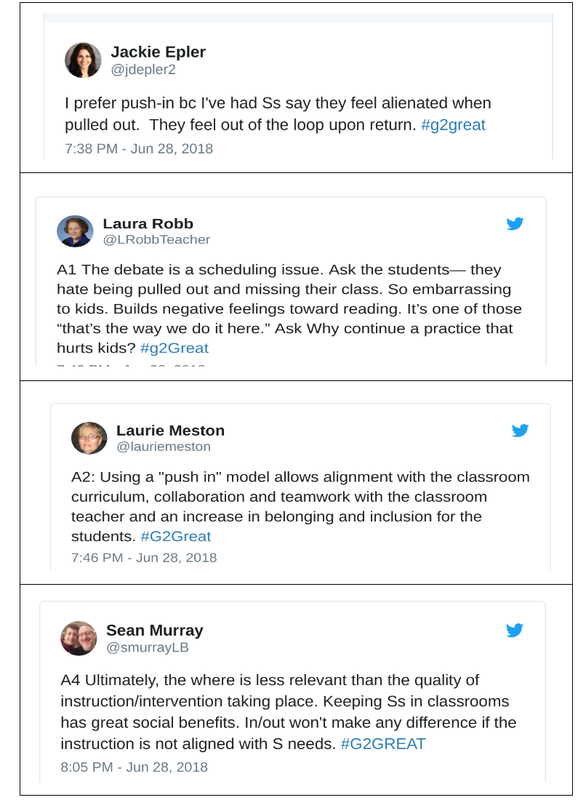 A network is created through NCTE that the #g2great chats recreate. Because of this, participants of the chats have become great friends for some of us that we are able to connect with through twitter or at NCTE each year and continue to learn from. It is truly a pleasure to meet new and amazing people. I pause to look back at the profound reflections of fourteen amazing young men and a teacher who trusted them to use their voices to have a positive impact on this profession. As I ponder their sage advice, I am reminded how inspiring it is to see them in action. I have had the great pleasure to watch them work their magic on a crowd and even to participate in their sessions. It has been an honor to get to know each of them personally and I am filled with deep pride for all that they stand for. But now I long for the changes they seek. You see, we talk a good game about keeping students at the center of our professional efforts but I wonder how often we actually bring the term student-centered to life where matters most. How often do we silence our voices long enough to ask our students how we can be better and truly listen to what that means from their eyes? And if we aren’t doing that, how can we make “student-centered” more than a buzz word and turn it into a reality that could lift us higher as professionals and thus transform our learning spaces into memorable experiences that are for and about students? Take a good look at this remarkable image. THIS beautifully reflects the collective spirit that defines this wonderful group of young men and one dedicated teacher. They each believe deeply in what they are doing and have banded together to help us to see our teaching through their ever so wise eyes. I think that we owe it to them and to this profession to pay attention to what they have to teach us. As I was finishing this post, I took a moment to peruse the chat once again. For the first time, I noticed a tweet from TQ Williamson shared just after the chat ended. I smiled to think that the #BowTieBoys experience will someday beckon an inspired and curious new educator into this profession filled with the hopes and dreams of what COULD be rather than what IS. 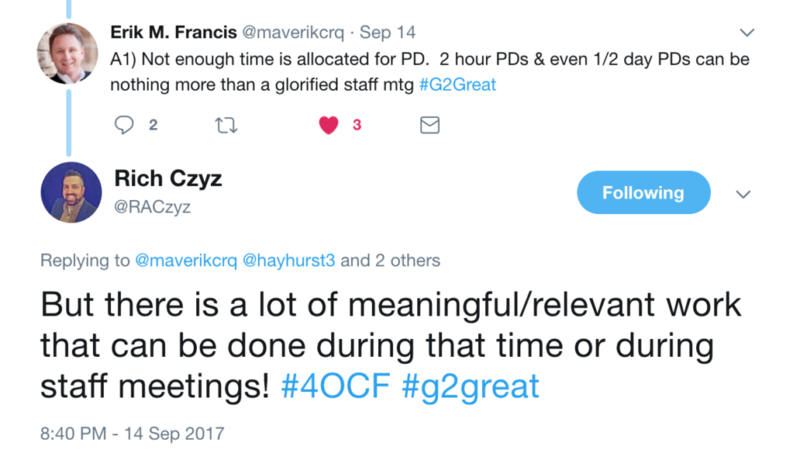 Let’s not wait to make TQ’s vision a reality! My eyes were devouring the text. Everything about the author. Everything. It’s been my pleasure to know Dave Stuart professionally, online as a blogger and in person, for several years. He is a teacher, author, speaker and thought-leader. Dave’s work impacted my practices and thinking as an educator when he encouraged teachers (and me) to “not freak out” over the Common Core. Many authors have written books about focus. A search for “focus” at Corwin Press had 827 results. A search of Amazon Books for “focus” resulted in 101 pages with a range of 18-19 entries per page. Focus has been a pretty popular topic. So what’s different? “Focus on What Matters Most” is the conundrum. Who decides what matters the most? Each teacher? Each grade level? Each building? Each department? Each district? Each state? Do you see the problem? 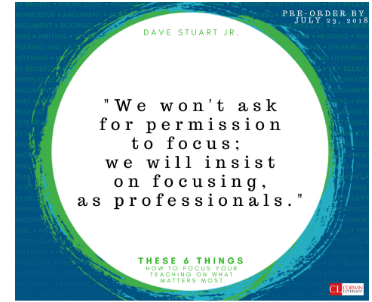 Dave proposes that we “focus on what we already know” as we work “Smarter, not Harder” and he gives us “permission to simplify.” No fancy language. No slick new strategy. No magic silver bullet. 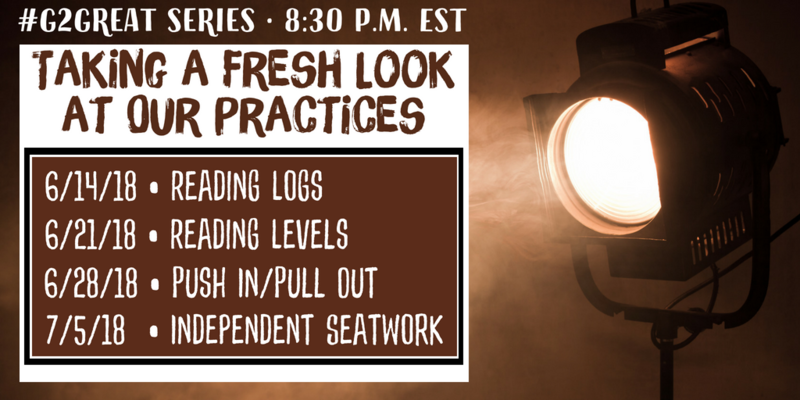 We learn from and with a trusted colleague, as literally, Dave shares how to streamline literacy instruction while increasing student achievement. There’s a no-nonsense attitude. A bit of a “git-r-done” response. Time spent, yes. Time wasted, no. 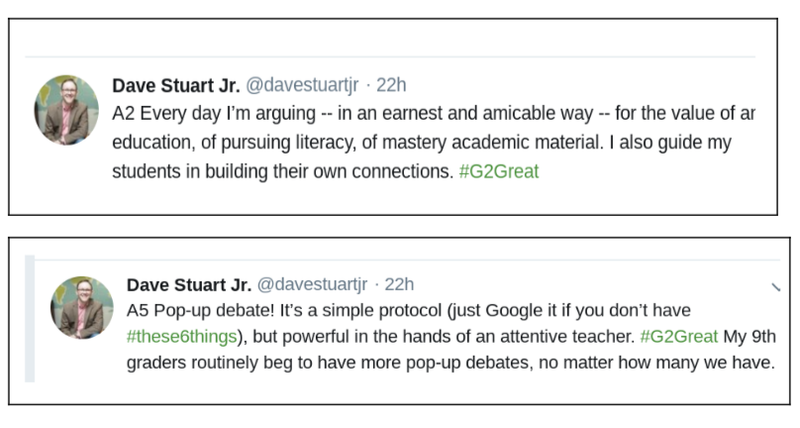 And that was the core of the #G2Great chat with first-time guest, Dave Stuart, Jr. on Thursday, October 25, 2018, as folks gathered around the #G2Great hashtag to converse and share ways to focus teaching. But let me give you one last piece of advice . . . this book will not solve all your problems. This book will not help you work eight hour days or less. If that’s what you are looking for, please stop reading now. Instead, this book will help you use a decision-making framework that focuses your values, your goals for your students, and some key content areas to work on improving. YES, improving. Growing your skills in a few key areas to maximize learning for students. A laser-like focus that will help your students grow into the life-long learners that you know they can be. Your reward will be in knowing that you have done the best that you can! Let’s get started! This was our opening quote. I’m going to invite you to take about 30 seconds now to pause and reflect. Pauses will be inserted at several points for some brief processing time. Pauses like speed bumps. Slow down, pause and think. What are your thoughts about this opening quote? What would it change for students in your district? 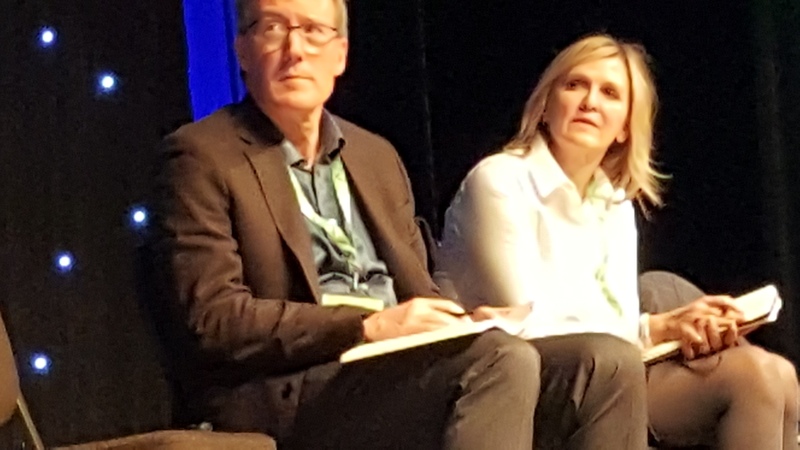 Dave argues that teachers need coherence of purpose, or an “Everest Statement” that encapsulates all that they hope to accomplish in a given year. What is the range of expectations for students? Academic? Life-long? Work-related? How broadly do folks think? 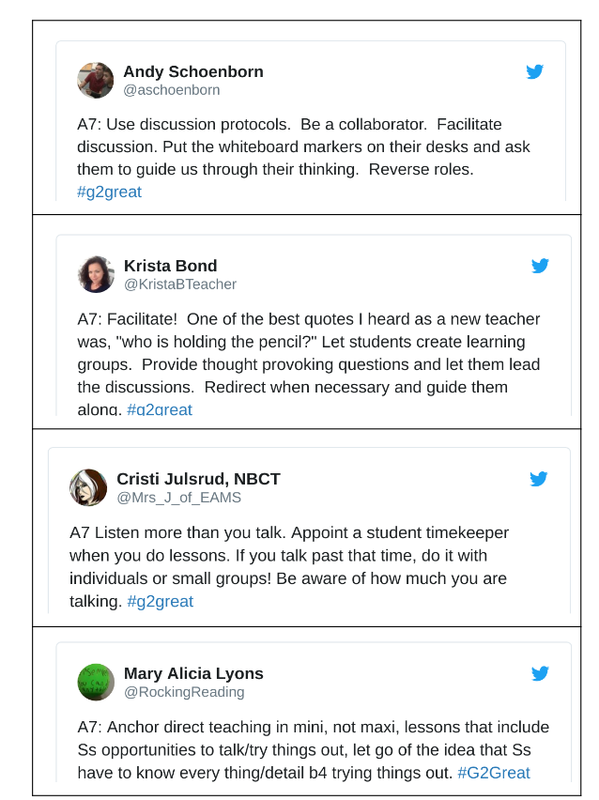 During our chat, discussion of “Everest Statements” ranged from readers, writers, thinkers, talkers to building relationships with students and teachers and moving striving students to more successful behaviors and habits. What is your “Everest Statement”? Did you co-create it with your students? Students need to do the work of learning. In order to do quality work, students must see some value in that work in order to complete it with “care, attention, effort and focus.” Otherwise, the work remains undone or of such poor quality that it is difficult to ascertain if students are learning. Teachers don’t have to be master entertainers with cute gimmicks and gadgets for students to learn. Instead, students need to know that teachers care and that teachers are asking them to do relevant work. How do you connect with students? How do the students know that you are credible? Learning does not happen in a vacuum. So many facts can be googled but there is still a basic layer of knowledge that precedes talk about a topic. This aligns with Bloom’s Taxonomy and Webb’s Depth of Knowledge. The key is not staying in the low recall level very long. What’s the implication for focus? Reading, writing, speaking and listening have to move to higher levels routinely and often. Analysis and synthesis require students to participate and think. Classroom routines and procedures need to nurture and lift up the complexity of student responses. How often are students moving beyond recall? What structures do you have in place for discussion? Being able to disagree with someone without being disagreeable is a learned skill that takes practice and involves both listening and speaking. An argument can be as simple as rehearsing two sides to a question to determine the next course of action or as involved and complicated as a formal debate. 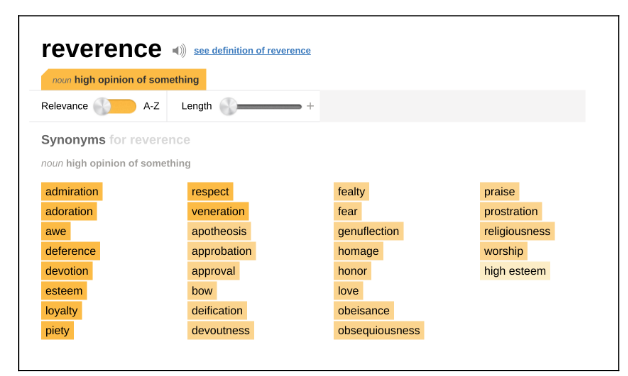 Arguments in content area classes can be about which examples best define a vocabulary term or which traits represent historical figures or about which tool has the best consumer product rating in an applied science course. 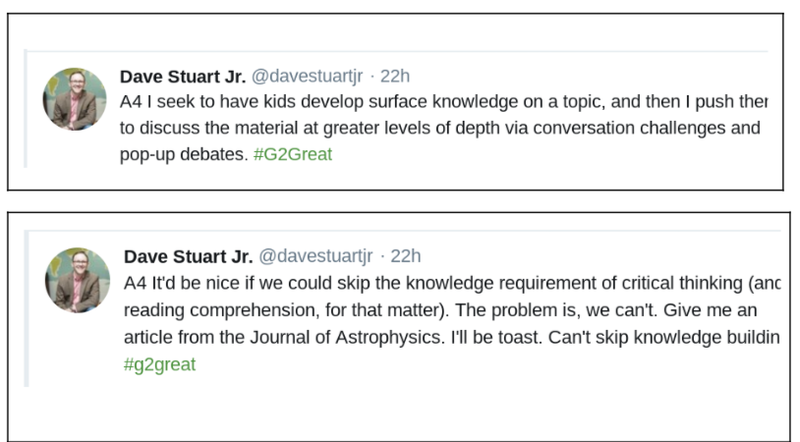 Dave uses “pop-up debates” to practice arguments. This is another example of a way to begin with some basic knowledge through reading, writing, or other media and then build up to evidence of the use of critical thinking. What role does argument play in your classroom? How might you use oral practice (pop-up debates) to build student skills before writing? Public Speaking. One of the biggest fears of most adults. If the speaking and listening standards at your school still resemble the Common Core standards, then speech is no longer relegated to a one semester high school course. Speaking and listening are required of every grade level and every content area PK – 12. That’s not just wishful thinking. Speaking or discussing is an easy formative assessment. Speaking is a quick check for understanding after reading. It’s an important rehearsal skill. And it’s also complex because spoken responses also run the gamut of Bloom’s or DOK skills. There’s also a delicate balance between the level of comfort in sharing ideas and disagreements that is dependent on the level of respect, trust and community in the classroom. What are my expectations of myself for public speaking? What are the expectations for my students? The role of focus in a teacher’s life is undeniable. Being as productive as possible during the teaching day frees up time for families and life outside of school. Time that is necessary to be the best teacher possible for every minute of the school day. Dave’s book won’t make all the decisions for you, but it will give you a framework for self-reflection and conversations with co-workers. That will put you on the path to a focus on WHAT REALLY MATTERS! What actions will move you forward? 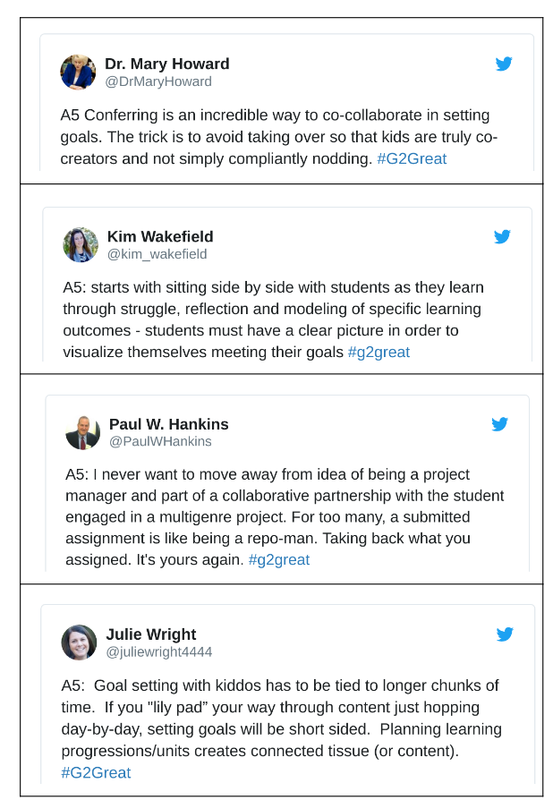 This post reflects some of the ideas from the #G2Great chat with a little background from the book. You will need to check out the book to get the full picture. You can simplify your teaching, teach all the standards and have a life. Dave Stuart Jr and these 6 things will start you on that journey. Grab a couple friends, read the free first chapter online, and get the learning started! 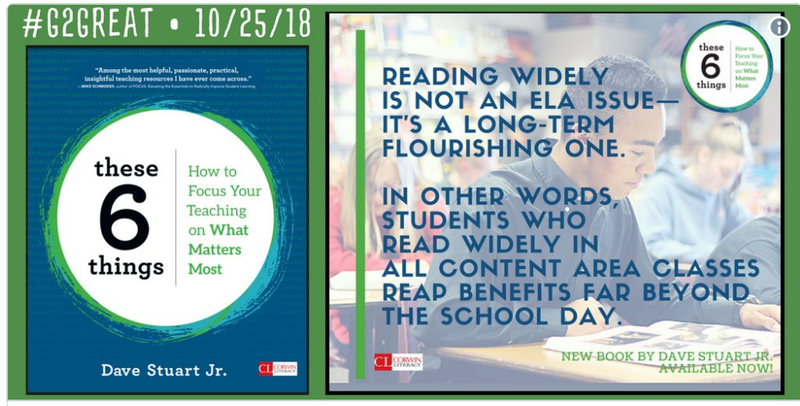 Check out the #NCTE18 program for sessions with Dave Stuart Jr.
Dave Stuart Jr. book signing at NCTE Saturday, November 17, 2018 at 4:15 in the Corwin Booth! Bloggers write to push the thinking of their readers. After reading, Harvey “Smokey” Daniels’ (@smokeylit ) Homewreck, as featured on The Robb Review, the entire #G2Great team was inspired to explore ways to reimagine homework. 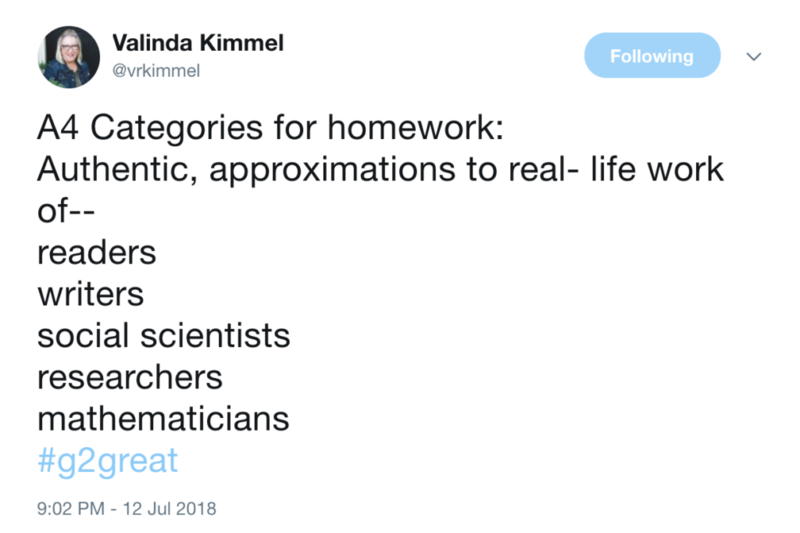 On July 12, 2018, we invited educators to engage in a broader conversation about the role of homework and how we might make it more worthwhile in the 21st Century. My third-grade teacher definitely believed in homework. Even though the school day was over, the far-reaching hand of my teacher knew no bounds. There I would sit, a little girl with curly hair, impossibly thick glasses, and a highly developed vocabulary, Monday – Thursday (mercifully Friday was my reprieve) with spelling lists, worksheets, and heavy textbooks – it was obligatory and there would be no negotiating. My mother, the saint that she was, would give me a snack, and let me leave Jeopardy on in the background to keep me “company” as I did my work. Jeopardy is still on the air, and for that matter, homework hasn’t changed much either. So, I wonder if Alex Trebek is some other child’s wingman to a homework dilemma of today. Change can only happen if we are willing to discuss trying something new. 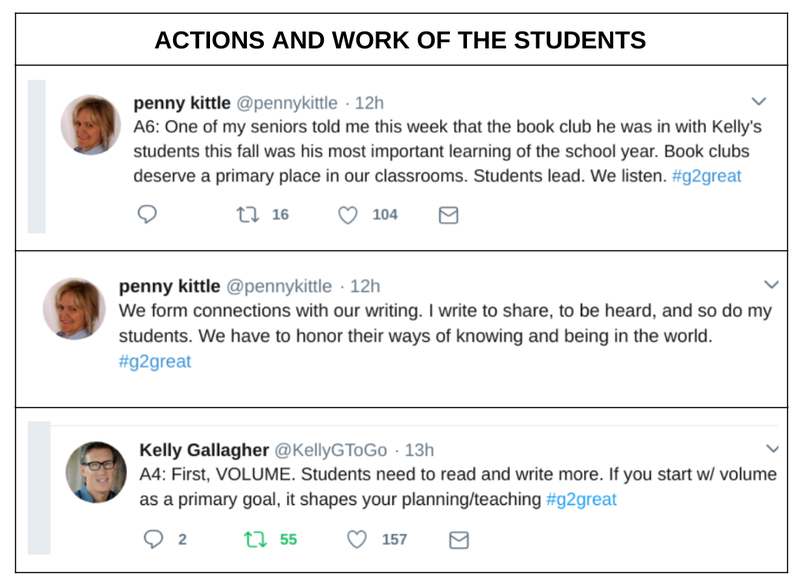 In Smokey Daniels post he writes, “The greatest source of tears and heartbreak in our family, over all of our child-raising years, was homework.” and #G2Great educators all seem to agree! Our words used to describe homework were: useless, irresponsible, and ineffective. The way we’ve done homework in the past is not worthy of students’ time and energy. 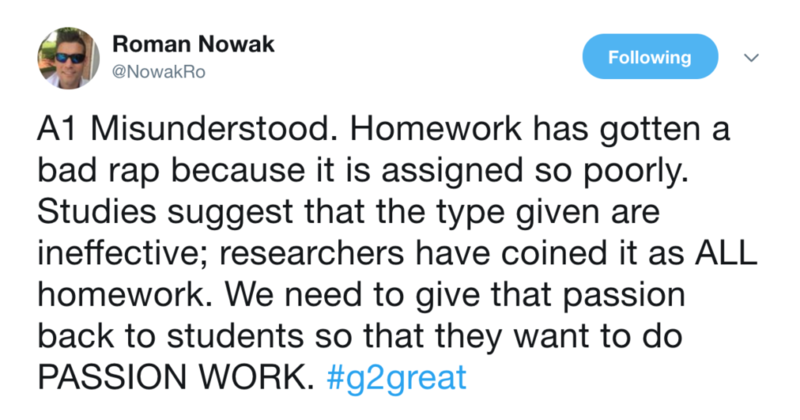 If we aspire to make homework worthy or, “homeworth” we might alleviate frustration if turned homework into passion projects, built around inquiry and relationship building. The best categories are ones that are self-selected and assigned by the students themselves. Reimagining homework means handing over the reins to students to pursue their interests and to stoke their curiosity. We can participate in this process and encourage their ownership and creativity if we involve everyone. That includes students, families, and colleagues. 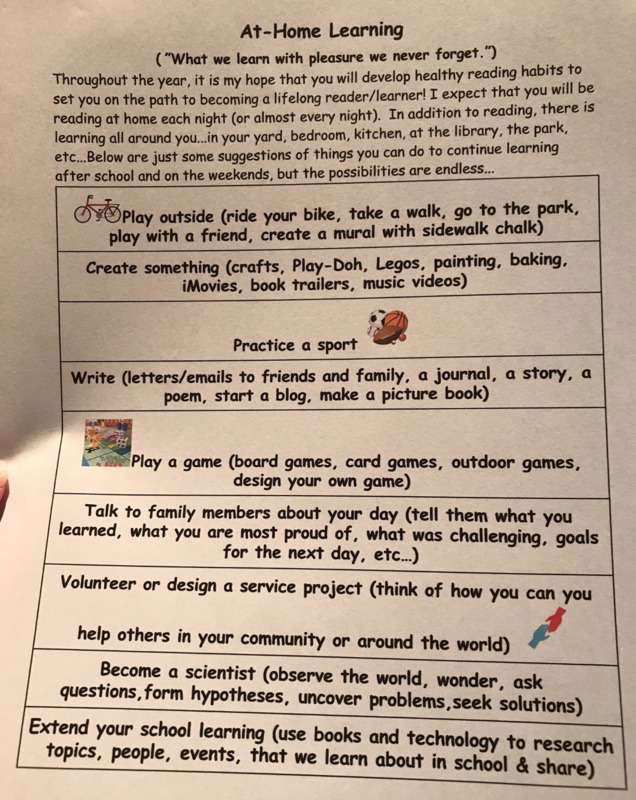 There would be a lot of moving parts but in the end, wouldn’t it be worth it to have happy, engaged children who wanted to continue learning outside of school? I believe it can be done. Let’s do this better for our students. 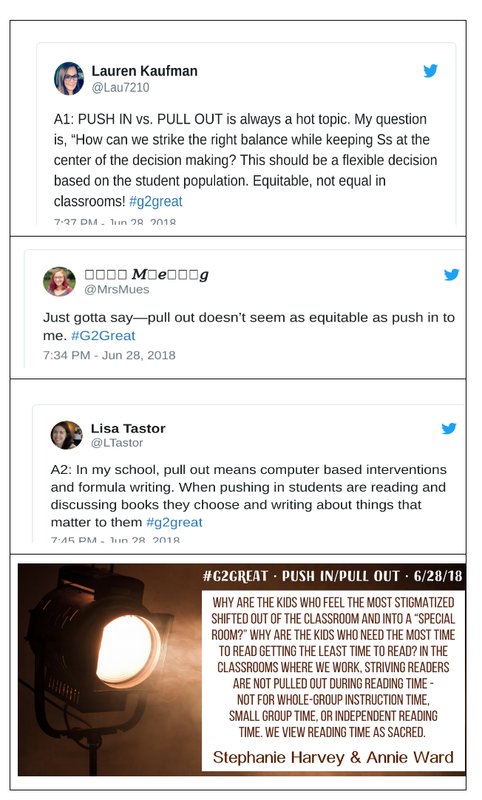 The fact that we were trending in the opening moments of our #G2Great chat “Shining a Spotlight on Push In/Pull Out”, on June 28, 2018, was not a surprise. Services for students with Individual Education Plans (IEPs) have been a hot topic since the first federal law, PL 94-142 (1975) which guaranteed: a free, appropriate education (FAPE) in the least restrictive environment (LRE). Every reauthorization since that initial law has involved change, but the requirement for educating students in the least restrictive environment remains a topic that requires ongoing discussion in every school across the country. A walk down memory lane in special education would also shine some light on “mainstreaming” and “inclusion” as other terms used to describe student services. Mainstreaming brought special-needs students who were being served in separate classrooms back into general education classes. It was assumed that these students would be able to find success once mainstreamed, but access alone was not the issue. Many students still struggled because specialized assistance within the regular education classes was not provided. To remedy this, inclusion was the next wave of reform. Students with special needs were placed in general education classes but were also supported by specialists in those classes. Co-teaching became one form of support that still exists because IDEA continues to require students to be educated in the least restrictive placement. As a former special education teacher who has taught in both push in and pull out programs, I eagerly anticipated this chat about services for ALL students including those who are striving, whether they have an IEP or they are Gifted and Talented. In reality this topic has huge implications because it can also include any student ever pulled out for any services: a Tier 2 or 3 Intervention, English Learner instruction, band lessons or even speech services. 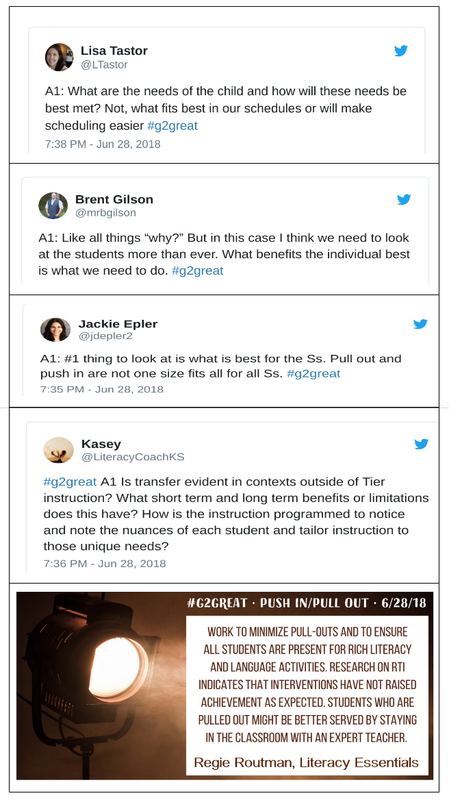 Let’s begin with what was revealed in our conversations during the #G2Great chat. 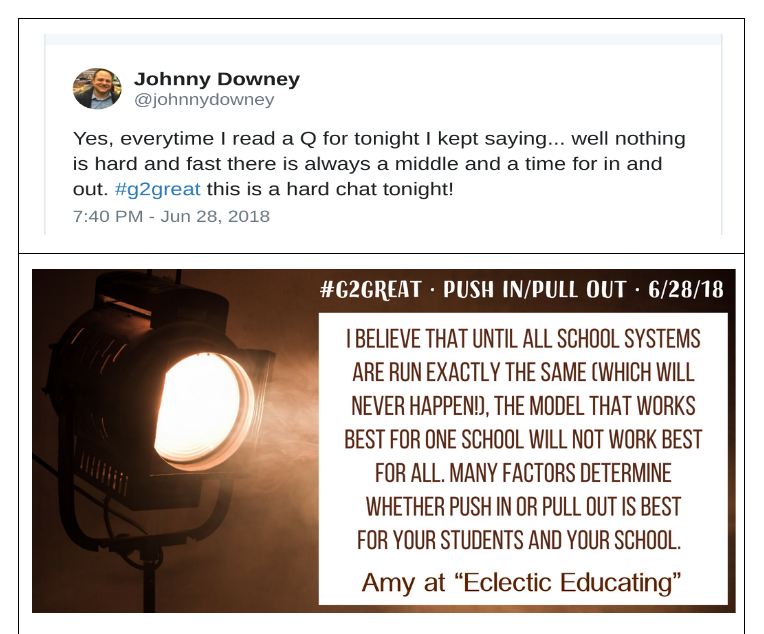 This quote of Johnny Downey’s sums up much of the thinking and also matched Amy’s quote about many factors being involved. It’s complicated! When is the location or the content of instruction an equity issue? The presumption is that each child will first receive quality core or Tier 1 instruction in the same classroom as their peers. Removal to another location through a Pull Out program during core instruction would be an equity issue because those students could be denied basic instruction. It depends what they would be “missing” in the classroom. However, this could also happen with Push In instruction if the student had small group instruction during a whole class Read Aloud time. The very elements of literacy instruction that are most needed by students, especially independent reading time, are often assigned as time for additional instruction. 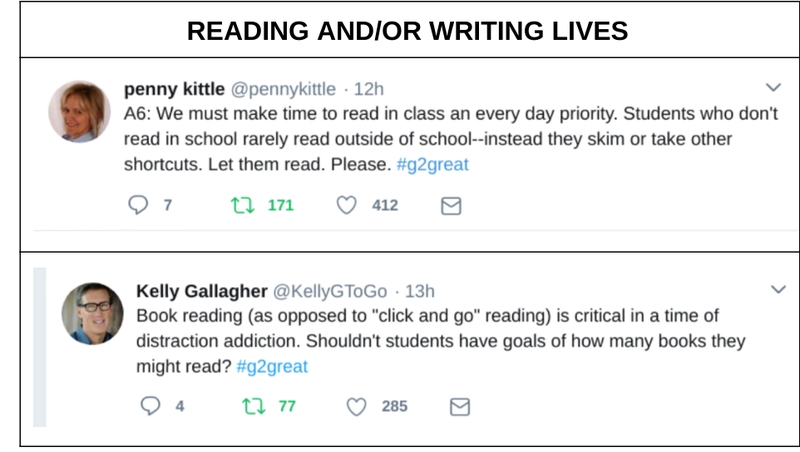 This does become an equity issue because the student may actually have access to less time for reading than his or her peers. What is the primary focus for decision-making? What issues must be considered? Quality Tier 1 instruction is critical and must be provided by expert teachers. Neither push in or pull out is ever perfect for all children. We must consider effectiveness of instruction and collect results to see if our students are really “learning” and if the support is increasing student success and joyfulness. Decisions cannot EVER be about time, the schedule or the adults. It’s not their education on the line. Sometimes, pull out instruction can be more efficient and more effective. Thoughtful discussions should always be a part of the process for EACH and EVERY student. And FINALLY, the biggest concern with Push In or Pull Out is the feelings and perceptions of the students involved. When do we include students in the decision-making process and what do they tell us? Access to quality instruction is the right of all students. Access in the least restrictive environment is also a legal mandate for many students as parents consider just where that instruction should take place. An arbitrary requirement for ONLY “Pull Out” or “Push In” services must be rejected because the needs of the students should be a central focus of all decision-making. Student responses to their education, as well as their attitudes and perceptions, need to be considered as the focus of staff must be to accelerate learning in order to decrease learning gaps and develop a love of learning. Team Teaching or Co-Teaching is one current popular way of meeting students’ needs in a less intrusive setting and you can read more about that in the Wakelet archive. Data on the successes of Push In / Pull Out settings is inconclusive but more students are successful in life after learning in Push In settings. Other positive benefits from Push In settings include: more positive interactions with peers, improvement on standardized tests, and increased social and communication skills. Decisions about instruction must occur on a student by student basis in order for ALL students to have access to the highest quality education available in the least restrictive environment. 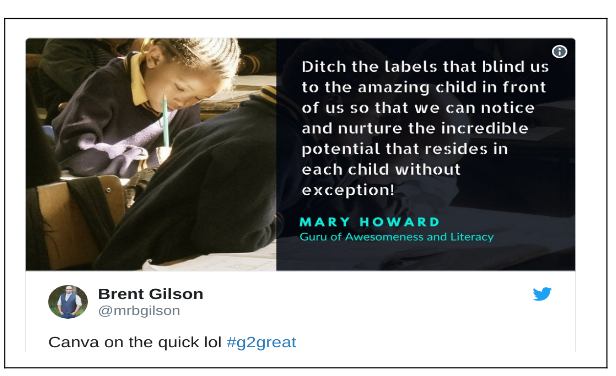 My post for the #BowTieBoys guest host stint at #G2Great in March seemed easy. I reread the questions, reviewed the tweets, considered formats and began writing. In fact it was so easy that I began worrying about this second post. What would be different or unique? What would be the bookends for the learning? I am in awe of these middle school and high school students: their focus, drive, poise and incredibly articulate positions on so many issues in education. As I worried about appropriately expressing my respect for their work, I remembered that April is synonymous with poetry. 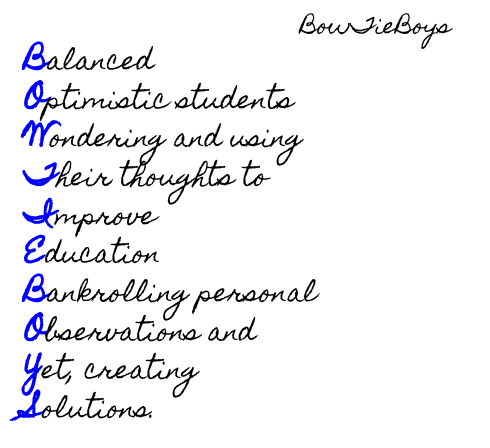 So I created this acrostic “fan poem” about the #BowTieBoys before we even had the chat and had my first 19 words. After the chat, I was still in search of my goal for this blog post – stuck with my 19 words and the title. 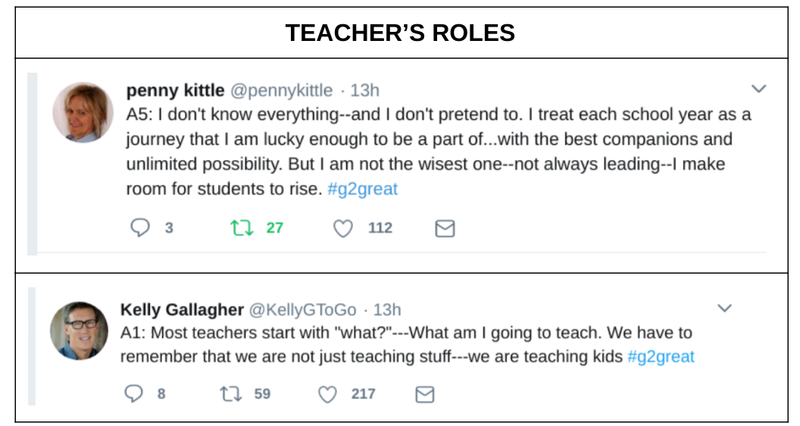 I dreamed of a post worthy of clearly and succinctly articulating the depth of their participation as guest hosts for #G2Great on April 26, 2018. But I felt like the center fielder who had missed a line drive straight up the middle. So I researched, reading previous Literacy Lenses posts as well as posts from the #BowTieBoys. I even DM’d Jason Augustowski about a post outlining the origin of this group. You can find those details in his biography here. I read through the Wakelet artifact, collected tweets and reread the archive again. Ideas swirled in my head. And then I reread the title: Exploring Instruction through Students’ Eyes: Group Work and Collaboration and the theme coalesced around that title. No surprise. The title became my North Star, my purpose. 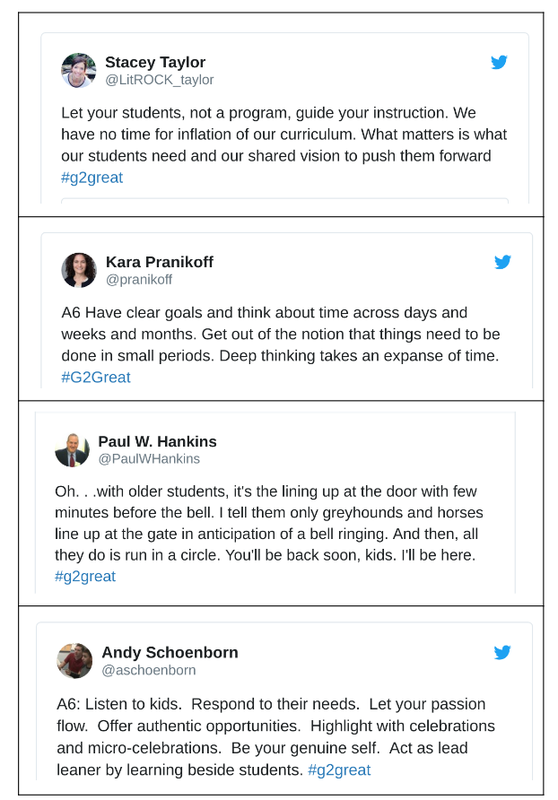 This group of students, ranging from 8th graders to juniors, wrote the questions, responded to the questions, and had multiple conversations with educational folks during the #G2Great twitter chat. In essence, they collaborated with each other in the question development and then participated collaboratively in group work during the chat. They executed group work and collaboration in an online format while sitting together in the same physical space. Middle school and high school students! Were the students doing this for participation points? Were the students doing this for a class requirement? Was there a rubric where the teacher was making tally marks for participating comments? Would a student be “marked down” for “not speaking up”? Student perspectives on learning are necessary in order to improve educational practices AND learning. Teachers need student feedback, beyond assessment numbers, that range from classroom environment to routines/procedures to the content and instructional delivery systems. Dr. Mary Howard is fond of telling us that our “WHY?” is our most important question to answer for any instruction, assessment or even planning. And she is so correct. Beyond teachers and administrators knowing the WHY, so must the students. The WHY cannot be left for students to infer. It should be obvious. It should be stated often. And it should be the driving force behind every decision made in the classroom, of the classroom and for the classroom. 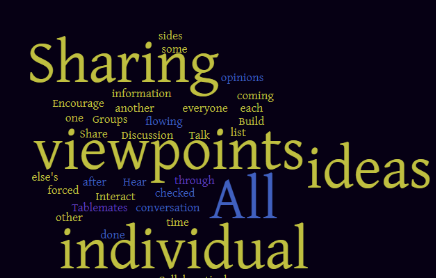 These tweets really helped me collect a wide range of thoughts about Group Work. Why these tweets? Because of the key words that popped out in this word cloud. Several priorities for Group Work had surfaced: Allowing all students to have a voice, providing opportunities to add ideas, affording time to discuss and/or gather information, new viewpoints and ideas, and encouraging others to interact. Aren’t those all habits and behaviors that employers want? Why would we ever be surprised that students want these? The surprise might be that students have not previously felt comfortable with sharing these needs. The surprise might be that some teachers don’t collect feedback from students. The surprise might be that the feedback is perfunctory and never acted upon. Why not have a combination of interactions daily in the classroom that allow students to learn together? Why not provide choice in interactions? Why not ask the students (voice) when learning is working as well as when it is not working? For this second big topic, I again returned to the tweets for the benefits of collaboration. 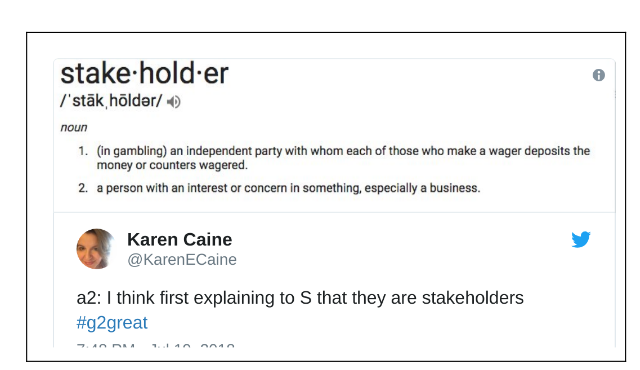 Merriam Webster defines collaborate as “to work jointly with others or together especially in an intellectual endeavor” so it does overlap with the previous Group Work conversation. The heart of collaboration is that new thinking or product emerges as a result of collaboration. 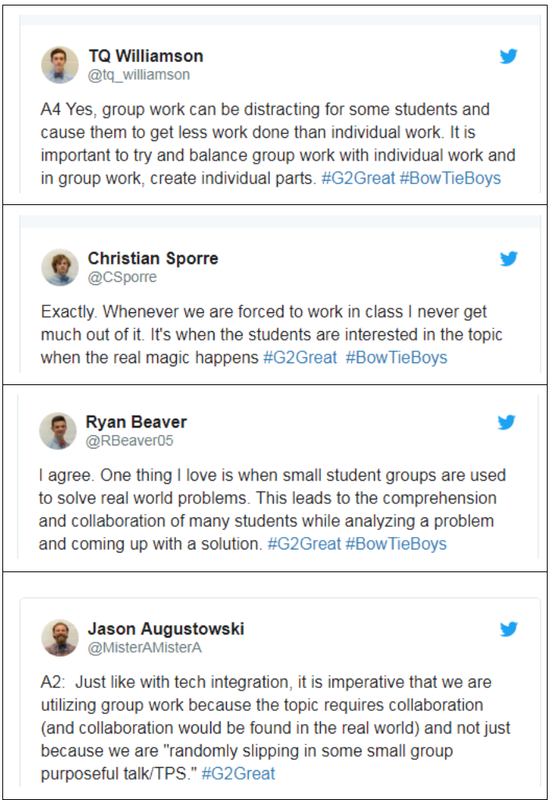 As you can see in the tweets, the students recognize that combinations of individual and group work are needed and that there needs to be a real purpose, not “just” a principal or teacher evaluation for the collaboration. The process of collaboration should include frequent checkpoints so that both the students and the teacher have frequent feedback on the effectiveness of the collaboration. Student ratings or rubrics designed collaboratively with the teacher and negotiated with group members are often effective. Will all groups be 100% effective every day? 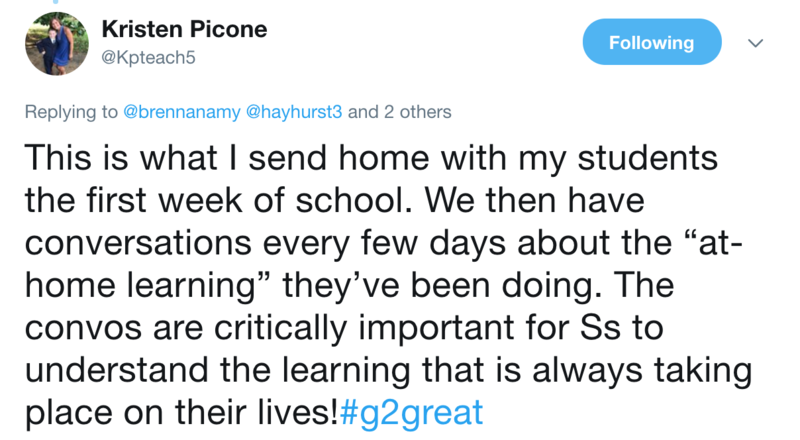 Probably not without some specially designed instruction, tasks and productive work that builds respect, trust and a community of learners commited to deep learning. As shared in the tweets, collaboration is not necessary for all tasks. Students recognize fake collaboration to impress an observer or to mark it off a checklist. And perhaps the beginning of a class period is not the best time for collaboration if students have not yet settled into the learning mode. Are there some tasks that are better suited to individual work? Having real world, meaningful tasks tends to make collaboration more successful. The goal is mutual learning. Students collaboratively involved in the learning processes have a deeper understanding of teaching just as teachers involved in collaborative work have a deeper understnding of student learning. When this commitment to education and learning is reciprocal, magic happens. 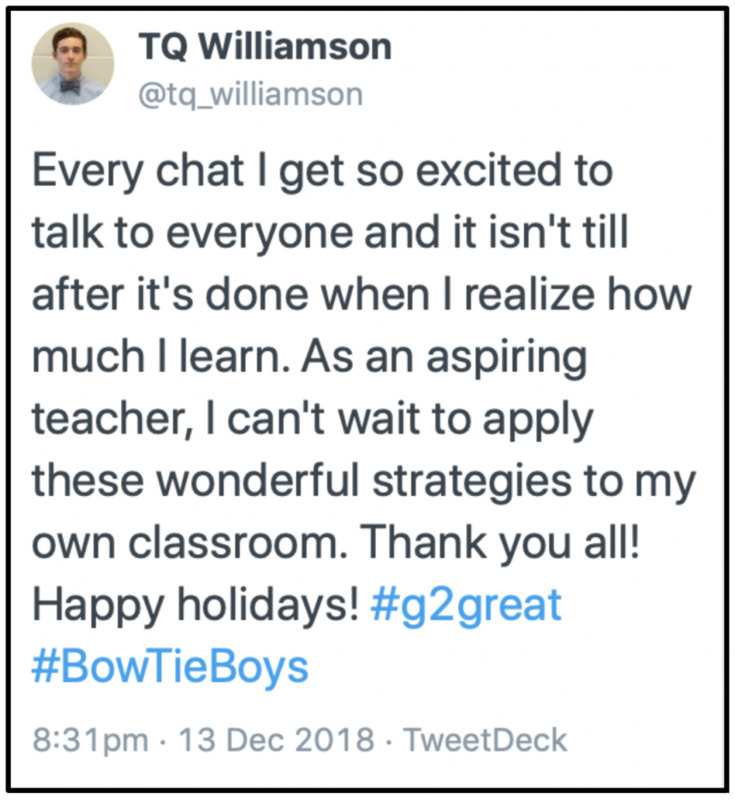 That magic was evident in our #G2Great chat with the #BowTieBoys. Students. Teachers. Learners ALL. Understanding WHY is the essential element. ACTION To Consider: Take these remarkable questions and discuss them with your teachers and classmates. WHY is Group Work important? Is all Group Work equal? How do Group Work and Collaboration support student learning? Find your WHY and find your guiding principles for learning! 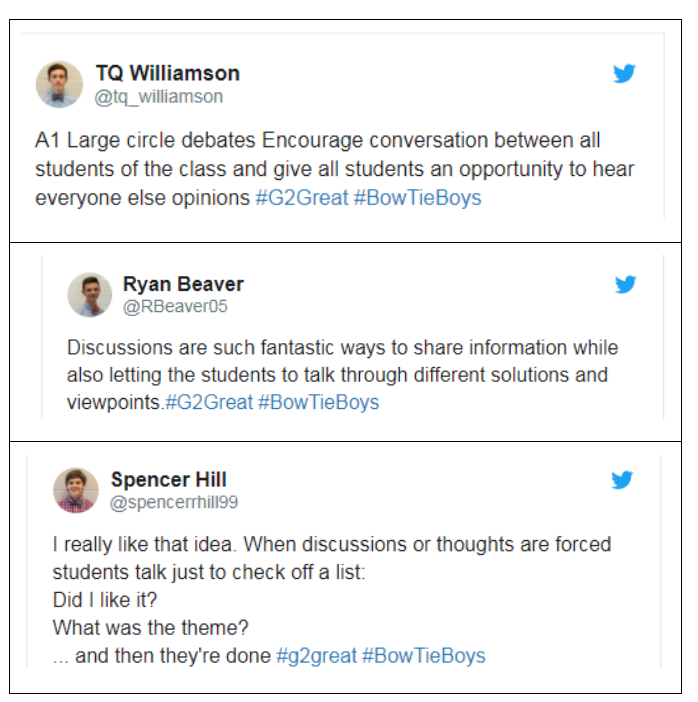 There was an air of excitement and electricity that led up to the #G2Great chat with the #BowTieBoys on March 8th. The boys, ranging from 7th graders to 11th graders, craft their own questions, greet folks to the chat and carry on conversations as veterans. 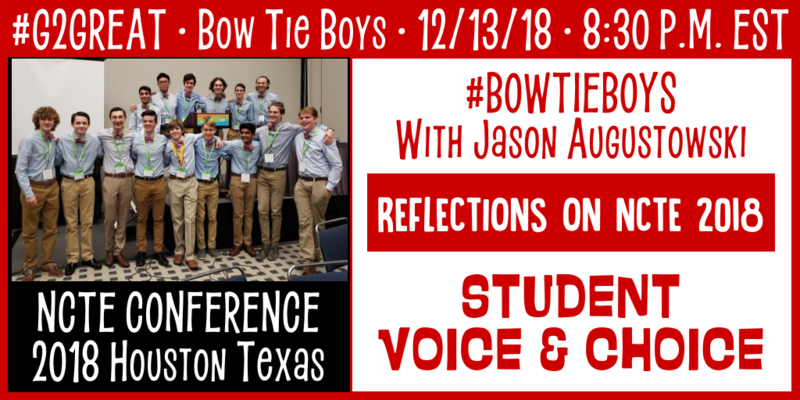 I’ve been lucky to “know” the #BowTieBoys for three years but I didn’t fully understand their depth of knowledge and commitment to improving education until #NCTE17. In St. Louis, I saw them individually and as groups multiple times across the days, as they were quite literally the first people I saw at the conference hotel and in four sessions over the course of the conference. The #BowTieBoys are some very gifted literate secondary students who have literally banded together to study how education could be improved. Their future plans and interests are as varied as they are. Meeting their parents at some of the sessions added another dimension to my understanding. What if students were encouraged to study the work of some of the best and brightest? And who would that be? They were on panels and in pictures with Lester Laminack, Linda Rief, Dr. Mary Howard, Penny Kittle, Kelly Gallagher, Kylene Beers and Bob Probst. They read and study professional education texts. Who wouldn’t grow and learn from those #Edu-heroes? What are the Keys to Creating a Positive Environment? Relationships and respect are so intertwined that it is difficult to have one without the other. As a teacher, it’s important to build relationships from day one in the classroom. That might be the conversations in the hall about the school event the night before, at the door about individual scores and expertise, or in the classroom pulling in specific student interests to engage the students in the learning. Respect is not about assuming it will be bestowed on teachers as a point of privilege. True respect is about caring for students and being able to be human when students do need a bit of extra care, or being able to laugh and joke as teachers and students learn from each other. Respect is a two-way street and students will earn teacher respect and trust as they also work on developing relationships and treating others kindly. Students have strengths that they can use to teach others in the class, perhaps in the area of digital tools but also in those areas of personal interest where they spend time every day. Transparency is often found in communication that builds on the relationships formed under mutual respect. Secondary students also prefer to have their voices heard as well as to have choices in their daily work. 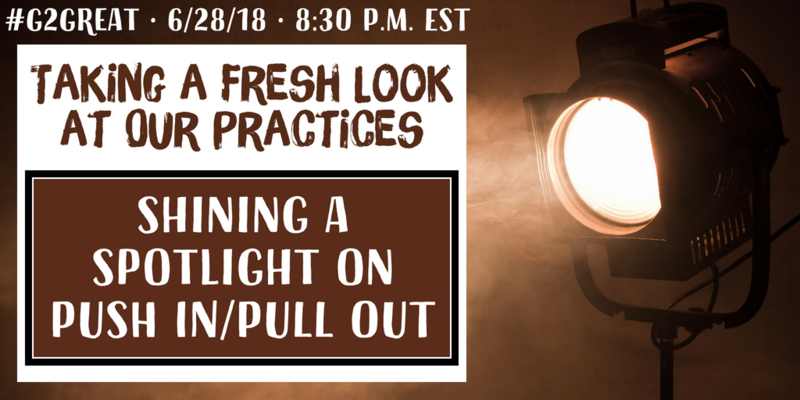 Teachers that can admit mistakes and move on not only exemplify transparency but they also model how to continue to grow and persevere in the face of difficulties. Transparency is necessary for a growth mindset for students and teachers. Other areas of transparency include: setting time frames for assignments together, having high expectations for all students and developing the assessment/evaluation criteria together. In a transparent environment, everyone is a learner and everyone makes positive growth. Above all, transparency assumes an openness and an atmosphere of honesty from both teachers and students that builds upon the respect previously mentioned and often includes asking for feedback from students and then acting on that feedback. Several strategies were mentioned during the chat including: time, transparency, and trust. Time included allocating enough time so students can work with their peers. Time to explore topics that students are interested in. Time to work on projects for creation or even problem solving. In addition to transparency qualities previously mentioned, allowing choice of assignments and opportunities to pursue tasks that allow quiet participation for students who prefer to work alone is important. Variations in groupings for work will And with trust, strategies that allow a voice in how the task will be evaluated, perhaps the co-creation of rubrics or the negotiation of due dates, are preferred. Trust can also be built as a part of those teacher-student relationships when teachers attend the co-curricular activities of their students. In the classroom, stress can be reduced by ensuring that time is allocated so that students always begin projects or homework in class, ask questions, and clarify that they know what the learner outcomes are. Students appreciate teachers who chunk projects into smaller shorter deadlines that enable students to have frequent check in points. Feedback along the way in bigger projects or tasks also allows students to know what they can do to improve learning. Simple conversations with students in terms of whether time frames seem reasonable, how can stress be reduced and how does this fit with other course requirements. 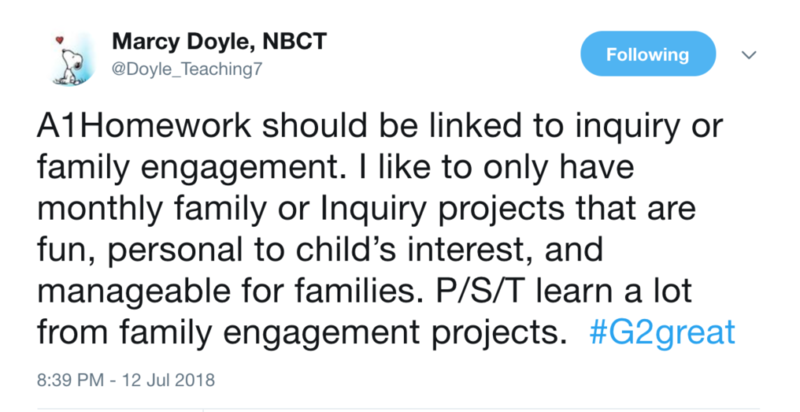 Similarly teachers who communicate with others can be aware in advance of due dates and not have three or four major projects all due on the same date. Stress is a real issue. Learning does not occur and students cannot thrive when a learner is under stress. That also means that tasks and projects should be valuable to students and teachers and not perceived as busy work. What are reasonable timelines for grading? If a task is assigned to be done in one day in one class period, how much time should the teacher have to grade that task? A typical “It depends” answer may prevail because if this is during class periods 4, 5, 6, 7, and 8 and the teacher’s prep period was period 2, the grades will probably not be posted that day. But is it fair for students if two or three days pass and those grades are still not posted? Grades are an interesting school phenomenon. Grades are after the fact and they close the door to learning. 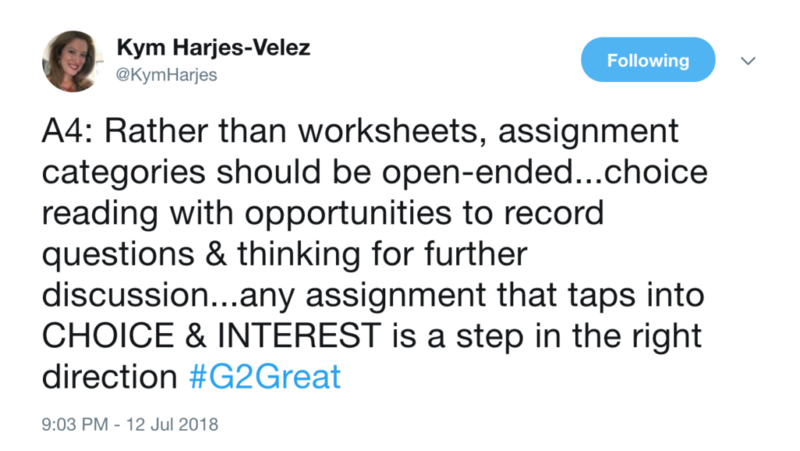 Yes, it would be nice if more focus was on learning and less on grading, but timeliness of grades is an issue that perhaps again relates back to transparency, relationships, and respect. Should cellphones be used in classrooms? Again the answer might be, “it depends.” If students in the building have 1:1 devices, the need for cell phones may be reduced. Sometimes cell phones might be more efficient uses of technology and/or feedback for students and teachers. The learning needs should drive cell phone usage rather than the need to have a fun, cute activity. This again, could be a source of both transparency and trust if students approach a teacher outside of class time with a new app or extension that would really make learning simpler in that classroom. Showing, explaining, and providing a rationale in a separate setting would also be respectful of student, teacher and class time. It is important for teachers to be consistent in their messages about how, when, and where cell phones can be used. But if that is not a skill taught at school, where will it be taught? How and when will students learn to manage the distractible portions of cell phone usage? Another feature of a positive classroom environment is student involvement in assessment and grading. This varies from classroom to classroom much to the dismay of students who may see this inconsistency as a lack of transparency. One way to involve students is to have student conferences. Recording the conferences on Flipgrid and sharing with parents would also be an increase in transparency. Students who help develop the rubrics that are used for assessments would also see this as a characteristic of a positive classroom environment. Teachers who routinely complete the “tests” themselves to check for accuracy and necessity are also respectful of their students and their precious learning time. How do your classrooms look? Are they inviting? Are they comfortable? Some considerations include furniture that matches the needs of the students and the various instructional groupings: space and tables to collaborate in teams, quiet spaces for reading or writing, as well as space for partner work. That might determine the need for tables instead of desks, couches instead of chairs, and a nook or two where students can seek solitude. Flexibility that responds to the needs of the students is important. 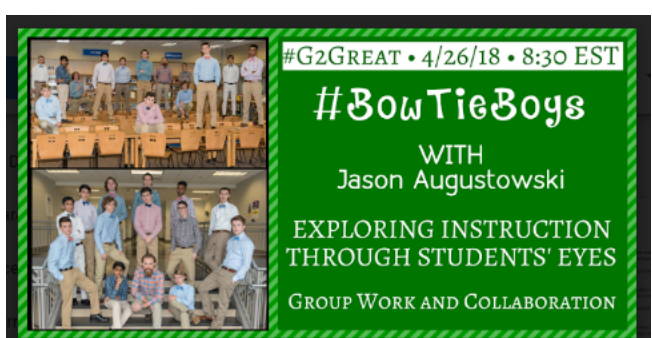 As you have read, you noticed the eight components the #BowTieBoys identified for a positive classroom environment were: Relationships and Respect, Transparency, Strategies to Engage ALL Learners, Low Student Stress Levels, Reasonable Grading Timelines, Cell Phone Usage, Student Involvement in Assessment and Grading, and Safe and Comfortable Classrooms. Others exist but these eight could generate great conversations. Have you checked in with your students lately about your classroom environments? What would your students say are the keys to creating a positive classroom environment? 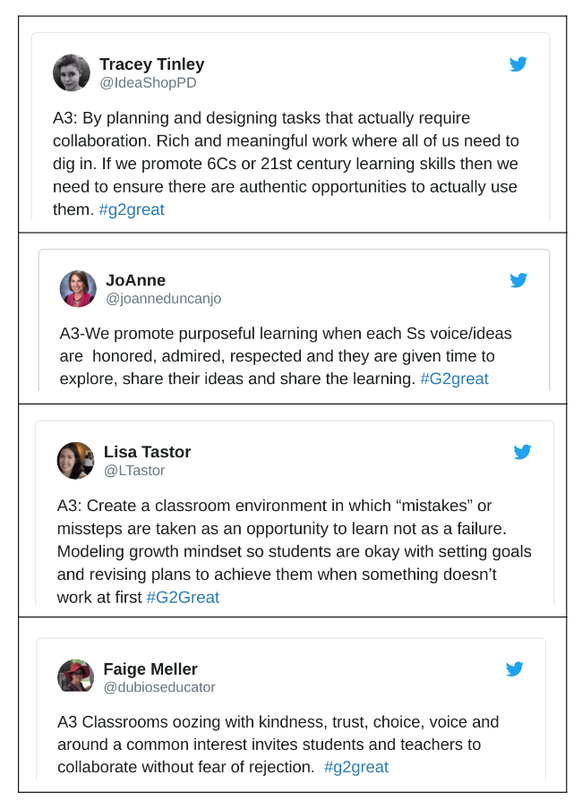 On March 1, 2018, we were thrilled to welcome dynamic duo, Kristi Mraz and Christine Hertz, back to the #G2Great chat table for the second time (Revisit their Mindsets for Learning chat on 7/21/16 here). 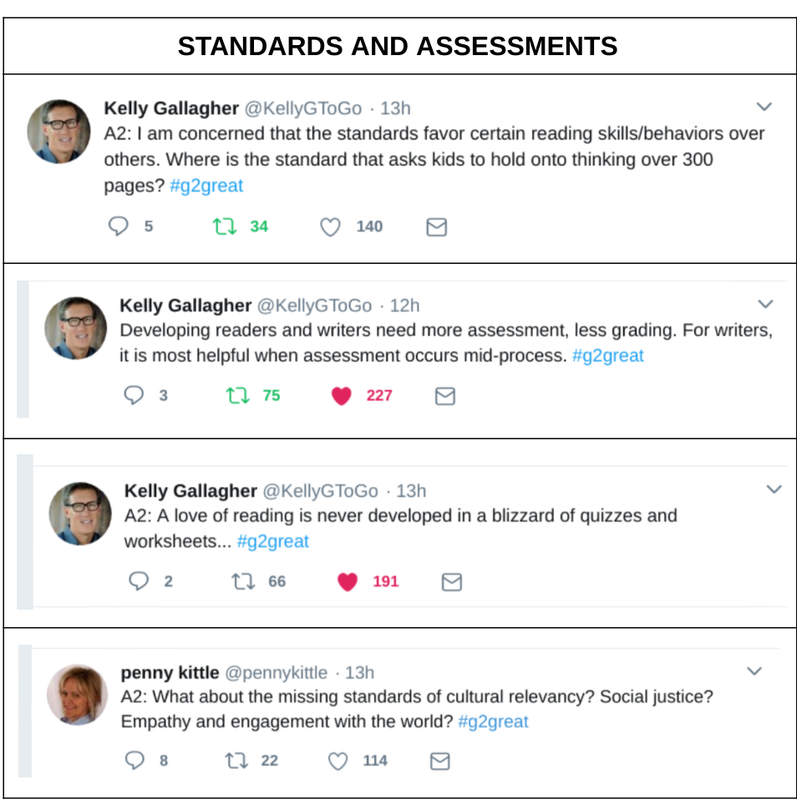 On this much anticipated return visit we collectively celebrated their remarkable new book twitter style, Kids 1st from Day 1: A Teacher’s Guide to Today’s Classroom (Heinemann, 2018). Just like that, I was utterly smitten and eager to accept their invitation to come along as they shared what they learned when they “sat with their failures and rose to teach again.” Their deep belief in joyful kid-centered learning rose from every page of this magical book that empowers us to sit with our own failures knowing that they hold so many potential successes. I smiled as I turned to the last page, filled with a renewed sense of hope for this profession. I paused to soak in the blessing of gazing into the eyes of their children where the real opportunities have always resided. This beautiful book is divided into four main sections: Heart Work, Physical and Emotional Environment, and Curriculum. Admittedly, I found myself returning to the Heart Work section to reread descriptions of flourishing, empathetic, playful, flexible, and reflective educators. Each of these rich professional qualities were also thoughtfully infused across each chapter. 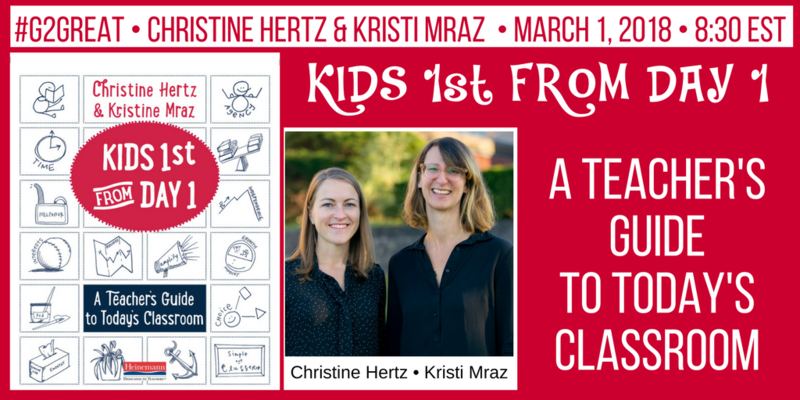 As our #G2great chat with Kristi and Christine began, my unquenchable thirst to enter the Kid’s 1st world they describe was my chat GPS. I eagerly searched for tweets that would add to my understandings – and I was not disappointed. My biggest challenge wasn’t finding interrelated tidbits of twitter wisdom but how to narrow those connections down for the purpose of this post. As I began to weave their chat wisdom with their book wisdom, ten big ideas emerged that beautifully illustrate the Kids 1st view described in their book. To combine both, my reflections on their chat messages are interwoven with their book message in italics. 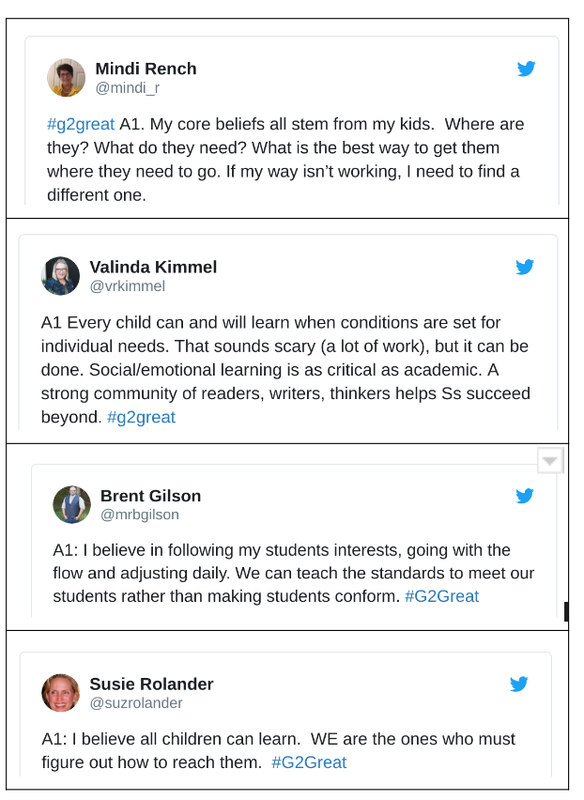 While these cannot possibly substitute for a deep read of Kids 1st From Day 1, they complement a shift from making students successful to giving children the tools to build their own success day after day after day. Kristi acknowledges that mandates have the potential to thwart our efforts to create a Kids 1st classroom while asking us to remain steadfast in our responsibility to children. In other words, we cannot allow compliance to deter us since success is possible when the factors are right. I love Kristi’s use of the word ‘power’ since I see this as a two-pronged factor in that we are taking back our own power so that we can hand that power over to children. Making room for student choice regardless of outside demands reflects that our commitment to children will always rise above our obligation to those “other” things, real or perceived. We should never feel compelled to make a choice between compliance to mandates over responsibility to kids. Christine’s tweet beautifully segued from Kristi’s Big Idea 1. She continues this discussion by emphasizing where our first allegiance lives and asks us to make the same shift from a different angle. We are once again reminded to return that power to teachers and children by “re-centering” our decisions so that children rather than school elements remain at the center of our efforts. Her choice of wording that “children lead the way” highlights the idea that we become empowered when we make the very decisions that begin with our children. They are our standard, our curriculum and every other element of school you could possibly mention – not the other way around. The memory of Kristi reflecting on the child who tore her management chart from the wall amid cheering peers is likely to stay with me for a long time (admittedly, I silently cheered from the sidelines). This Kids 1st illustration from a child’s perspective at its finest illustrates that we do our children a disservice when instructional control is at helm. Kristi asks us to replace control with a renewed emphasis on instructional experiences. We can only be responsive and intentional when we offer faded support that is designed to promote increasing independence. We know that we must ensure that our children will assume their rightful place at the helm and this means that we have the courage to step aside so that they can man their own learning ship. Christine helps us to broaden our Kids 1st scope by moving from a now to next view. This wider lens allows us to look to the future as we make our teaching focus about “life” rather than school. While it is certainly our responsibility to have an impact on our children for whatever time we are blessed to them in our care, a Kids 1st perspective always seeks a higher purpose that will live beyond this time so that our impact will linger long after they leave our care. The only way that we can have a classroom that (mostly) hums with collaboration and camaraderie is if we are willing to increase agency and thus give students ownership of learning. When I think back on the five qualities teachers bring to the Kid’s 1st table, authenticity always looms large since it seems to me to be the glue that holds each of those qualities together. By bringing our true and most authentic selves to the experience each tine we are in the company of kids and fellow teachers, those qualities will almost always follow. Kristi wisely reminds us that the ME we purport to be and the ME we demonstrate by virtue of our actions in their company must be one in the same. Authenticity is a tap on the shoulder that we believe we owe it to children to be our best selves – for us and for them. That makes teaching joyful, rewarding, and meaningful. Room design has gained renewed educational interest as teachers scramble to enthusiastically change each aspect of room design. Unfortunately, these designs far too often hyper focuses on the design itself over how that design becomes a mirror that reflects the unique needs of the children who reside in those spaces. Kristi reminds us that a Kids 1st design must carefully match that learning needs of our children. For this reason, our learning design will rise from their specific learning needs and this will always varies according to the children within those spaces. 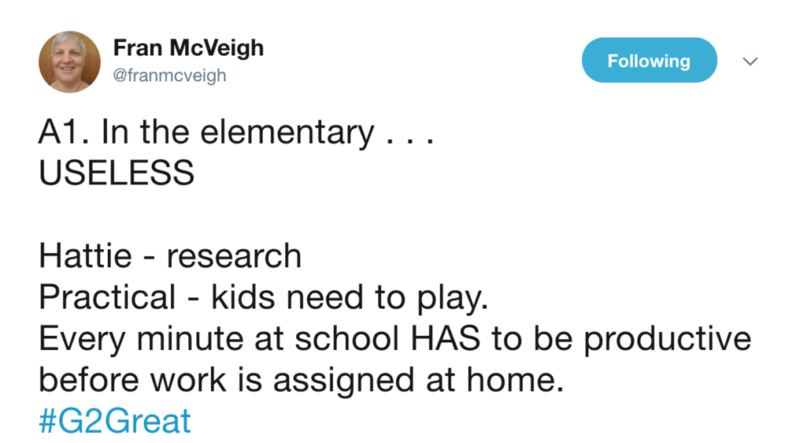 We can only do this if those decisions are guided by our design for the flexibility to be spontaneous in how the classroom is arranged… and that includes children by design. In their book, Kristi and Christine define empathy as the “ability to see the world from another person’s perspective and to understand and feel what that person feels in the moment.” They further distinguish empathy as feeling like rather than for others. Christine shares what every Kids 1st teacher knows – that modeling empathy is not a point of arrival but rather is something that we foster in ourselves and others on a daily basis. I love Christine’s view of empathy as giving ourselves permission to joyfully see the world from a child’s perspective. What a lovely reminder that each of us can re-experience the world from a child’s eye view and appreciate that world all over again. This is a blessing in every sense. Kristi and Christine acknowledge that “building a productive, functional, joyful community of unique individuals” is not a simple endeavor by any means. In a Kids 1st classroom, we do not confuse classroom management with building community. We recognize our responsibility to help children become one of many and to develop the skills that will allow them to do so even within a myriad of unexpected events that we may not even be able to anticipate. This does not happen by chance but by intentional and explicit modeling as we support and extend these day to day experiences that will inevitably fill our classrooms with powerful learning opportunities. 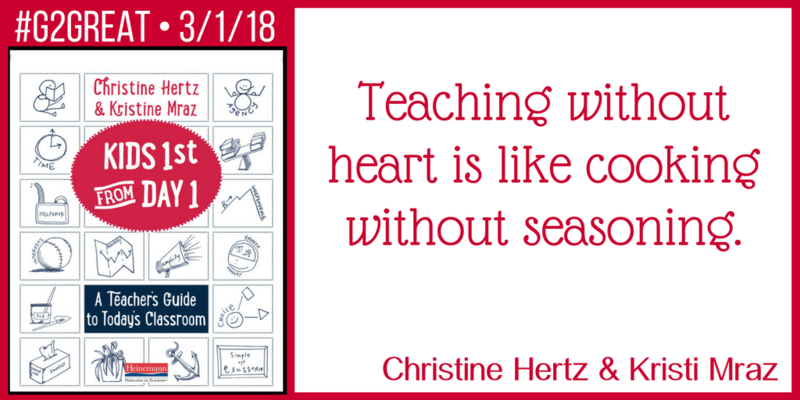 Christine’s words bring to mind a vision of the ball and chain that seems to tether teachers everywhere to an unrealistic view in an elusive search for the “perfect teacher.” In Kids 1st, they remind us “Don’t hope for perfect, plan for growth” (ours and theirs). I chuckled at Christine’s idea to create a “letting go of perfection teacher support group” but that just might be an idea worth pondering. It seems to me that perfection is in our teacher DNA, and yet an unrelenting pursuit of perfection can blind us to the incredible learning opportunities that may be hiding just out of the perfection view. We can instead celebrate hard work that comes from wading joyfully in the mess and realize that we can emerge unscathed and better for the experience. My best learning has always come from my less than stellar teaching trials and tribulations. Let’s not avoid them – let’s celebrate them! As I look back at this exquisite book and the #G2Great tweets that Kristi and Christine have written in honor of kids and teachers everywhere, I am inspired anew. They share their hope that in writing this book their words may have “tugged on a thread that caught your heart and mind…” and I can wholeheartedly say ‘Mission accomplished!’ Kristi and Christine have challenged us to renew our own vision for what is possible as we re-envision our teaching using a Kids 1st perspective. It is my deepest hope that every educator will accept their challenge to bring their Kids 1st vision to life in honor of incredible children who deserve our best everywhere. Thank you for showing us what heart work looks like Kristi and Christine!